There's a lasting feeling with the DTX950K that to realise its full potential you need to work with it, not just settle for using it 'as is'. Most serious players will take it and use it with their own palette of external sounds in a working environment, and Yamaha have made it easier than ever for their top-line kit to integrate with the world outside. DAW and VST control will be the way forward for kits like this, and Yamaha have pioneered the way in convincing fashion. Excellent rack, heads and cymbals. The included rock/metal kit emulations a little clanky. Control of external software, sampling and USB connectivity are some of the key features of the module, which hooks up efficiently to the outside world. 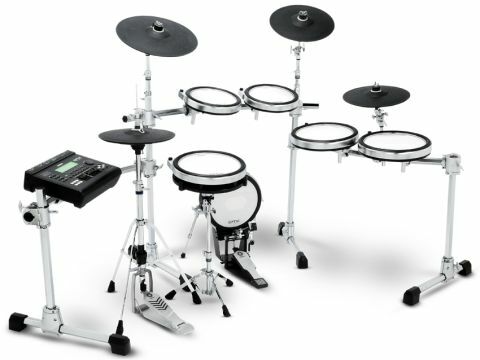 As one of the heavy hitters in the electronic drum set market, whenever Yamaha releases a new e-kit, it's always an occasion. And increasingly so. With the arrival of the Yamaha DTXtreme III flagship a couple of years ago, the Japanese corporation took a significant step up in terms of both playability and sound appeal. And now they've improved the top end of their DTX range further with the introduction of the new DTX900 module and DTX950K kit. The big news as far as the kit itself is concerned is the arrival of the new DTX pads. These sport neither straightforward rubber nor mesh heads but instead benefit from a Yamaha innovation, the Textured Cellular Silicon Head. Clever manufacturing sees air bubbles within the head material manipulated to alter the density of the head depending on application. So the toms feel softer than the snare head, for example, just as they're likely to on an acoustic kit. This being Yamaha's new top-end offering, the whole kit is impeccably put together, and the chassis on which each head sits is very well engineered. Each of the drum pads is a hefty, well-sized and supremely tough unit, with plenty of rigidity to ward off mis-triggering. And indeed to cope with the rigours of regular set-up and tear down. "Yamaha have made it easier than ever for their top-line kit to integrate with the world outside"
This is a kit designed to shrug off the most demanding use, as evidenced in the truly excellent Yamaha Hexrack that holds everything together. As an acoustic drum-maker, Yamaha has masses of experience of traditional hardware to draw on when it comes to putting together this kind of electro kit. And in fact it draws directly from its acoustic hardware range for the rig here. Despite having six pads, three cymbals and a module mounted on it, the rack is a thing of beautiful simplicity and fits together with no fuss whatsoever. It's a joy to assemble, which is a rare thing indeed. Hugely sturdy and boasting a fair old footprint, there's no undesirable movement from any part of the rack - and memory locks and over-engineered clamps do sterling service in making consistent set up both quick and secure. Ace. In terms of what's mounted on the rack, Yamaha treat us to a 12" snare, two 10" high toms, a pair of 12" low toms, two 13" 'crash' pads and a 15" 'ride'. The sizing strikes a good balance between usability and compactness; if you're long of limb the rack allows plenty of scope for a big, expansive set up, but if you like things cosy and close together, the size of the pads doesn't conspire against you. So the rack and pads are impressive, but how does the new DTX900 brain stack up? Well, it's based on the outgoing DTXtreme III, itself the best module Yamaha had ever produced, so it starts from a decent foundation. But there is one very significant advance from the previous brain - the ability to control a DAW (Digital Audio Workstation) direct from its front panel. Yes indeed, the DTX900 allows integration with Cubase AI5 (which is bundled with the kit) without recourse to your PC's keyboard and mouse. The unit will also hook up to VSTi's within Cubase, so if you're using BFD, Superior Drummer, etc for drum sounds you can gain access to these via the DTX900. The cynical reader might be inclined to raise their eyebrows at Yamaha's Textured Cellular Silicon pads. After all, weren't manufacturers happy to trumpet their rubber pads as 'feeling just like the real thing' a few years back? Prejudices need to be cast aside here however, because the new technology has resulted in some excellently responsive, playable and quiet playing surfaces. We're not sure the question of whether these - with their forgiving but rebound-friendly feel - or mesh head pads are preferable is valid, so we're not going to come down in favour of either of them. One thing we will flag up is Yamaha's continued use of a control pot mounted on the 'rim' of the pads. For quick, mid-set tuning or snare tightening/loosening, it's a boon and we're glad the feature has stayed with the newbies. Hands-on control is something of a DTX950K theme. As mentioned above, the module can act as a simple DAW controller, making solo productions significantly easier than they might otherwise be. Straight from the box, the DTX900 allows all the basic 'transport' functions - play, stop, record, forward and rewind - to be controlled from its front panel, as well as quantise, screen zoom etc. In addition, functions can be assigned to the 900's special function buttons, allowing you to customise a set-up according to how you like to work. For drummers working on laptop productions, this arrangement is a valuable part of the DTX900's arsenal. While heavy-duty editing is still the domain of the mouse, rollerball or whatever, the ability to sit at the kit, select tracks to record and get performances onto the hard drive makes the recording process much easier. And this kind of tethered communication between e-kit and Mac/PC is surely the way forward - as evidenced by the ease with which the DTX works with drum software, opening up access to the best virtual sounds in the world. That's not to say that there aren't some great sounds in the 900 itself. The funk-oriented acoustic kits in particular are very nice to play, particularly in the context of the appropriate play-along tracks. In fact, many of the 'middle-path' acoustic emulations fare well - the slightly less convincing tones tend to be found in the rock/metal kit offerings. At this end of the spectrum, things get a little clankier than we'd like, showing up a tendency towards a somewhat machine-gunny response on occasion. It's something that can be mitigated by some judicious tweaking and technique, but it's there nonetheless. Concentrating simply on what's presented to you straight from the factory misses the point with a kit like the DTX950K, though. The scope to import/record your own samples, trigger external sound sources (whether hardware or software) and to work on tweaking preset sounds and effects means that the factory set-up is simply a foundation to build on. Fortunately, Yamaha have done enough with the DTX950K to make that foundation very solid indeed.